Let’s investigate constant speed some more. How long would it take him to run 8 miles? How far could he run in 30 minutes? Kiran and Clare live 24 miles away from each other along a rail trail. One Saturday, the two friends started walking toward each other along the trail at 8:00 a.m. with a plan to have a picnic when they meet. Kiran walks at a speed of 3 miles per hour while Clare walks 3.4 miles per hour. After one hour, how far apart will they be? Make a table showing how far apart the two friends are after 0 hours, 1 hour, 2 hours, and 3 hours. At what time will the two friends meet and have their picnic? Kiran says “If I walk 3 miles per hour toward you, and you walk 3.4 miles per hour toward me, it’s the same as if you stay put and I jog 6.4 miles per hour.” What do you think Kiran means by this? Is he correct? Several months later, they both set out at 8:00 a.m. again, this time with Kiran jogging and Clare still walking at 3.4 miles per hour. This time, they meet at 10:30 a.m. How fast was Kiran jogging? On his trip to meet Clare, Kiran brought his dog with him. At the same time Kiran and Clare started walking, the dog started running 6 miles per hour. When it got to Clare it turned around and ran back to Kiran. When it got to Kiran, it turned around and ran back to Clare, and continued running in this fashion until Kiran and Clare met. How far did the dog run? The next Saturday, the two friends leave at the same time again, and Kiran jogs twice as fast as Clare walks. 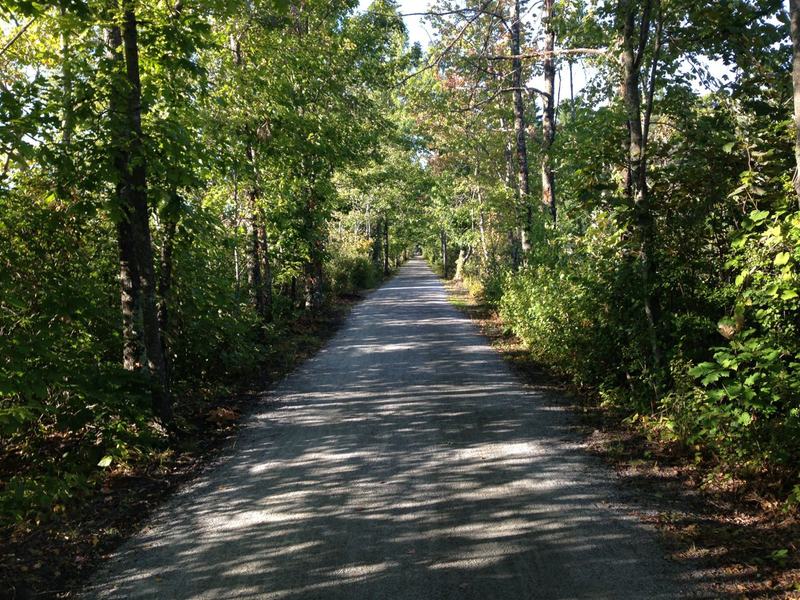 Where on the rail trail do Kiran and Clare meet? Jada bikes 2 miles in 12 minutes. Jada’s cousin swims 1 mile in 24 minutes. Who was moving faster? How much faster? One day Jada and her cousin line up on the end of a swimming pier on the edge of a lake. At the same time, they start swimming and biking in opposite directions. How far apart will they be after 15 minutes? How long will it take them to be 5 miles apart? When two objects are each moving at a constant speed and their distance-to-time ratios are equivalent, we say that they are moving at the same speed. If their time-distance ratios are not equivalent, they are not moving at the same speed. We describe speed in units of distance per unit of time, like miles per hour or meters per second. A snail that crawls 5 centimeters in 2 minutes is traveling at a rate of 2.5 centimeters per minute. A toddler that walks 9 feet in 6 seconds is traveling at a rate of 1.5 feet per second. A cyclist who bikes 20 kilometers in 2 hours is traveling at a rate of 10 kilometers per hour. We can also use pace to describe distance and time. We measure pace in units such as hours per mile or seconds per meter. A snail that crawls 5 centimeters in 2 minutes has a pace of 0.4 minutes per centimeter. A toddler walking 9 feet in 6 seconds has a pace of $\frac23$ seconds per foot. A cyclist who bikes 20 kilometers in 2 hours has a pace of 0.1 hours per kilometer. Speed and pace are reciprocals. Both can be used to compare whether one object is moving faster or slower than another object. An object with the higher speed is faster than one with a lower speed because the former travels a greater distance in the same amount of time. An object with the greater pace is slower than one with a smaller pace because the former takes more time to travel the same distance. Because speed is a rate per 1 unit of time for ratios that relate distance and time, we can multiply the amount of time traveled by the speed to find the distance traveled. Pace is an attribute that tells you how fast or slow an object is moving. A greater pace means the object is moving more slowly. Pace is measured in units like seconds per meter, hours per miles, and minutes per kilometer. Speed is an attribute that tells you how fast or slow an object is moving. A greater speed means the object is moving faster. Speed is measured in units of distance per unit of time like meters per second, miles per hour, and kilometers per second.